New York City Truck Attack Brings Deadly Terrorist Trend to the U.S.
For a little more than a year, Americans have watched vehicular terrorist attacks strike Barcelona, Stockholm, Berlin, London and Nice — and on Tuesday, the deadly threat was carried out in America's most populated city. “It was really only a matter of time, I think, before these tactics migrated here,” said Colin Clarke, a political scientist with the RAND Institute. “In fact, I’m surprised it took so long for us to experience something like that. It was going to happen here." 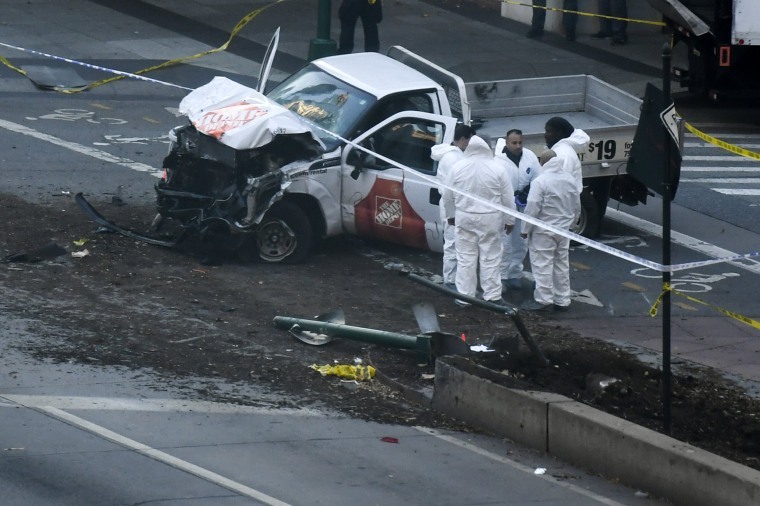 A motorist in a rented pickup truck killed eight people and injured a dozen others after barreling down a bike path in lower Manhattan on Tuesday afternoon. Officials called it an “act of terror,” making it the deadliest terrorist attack in New York City since Sept. 11, 2001, where more than 2,700 people were killed in New York alone. Clarke said that while law enforcement in New York has “taken great lengths to prevent these types of attacks after 9/11,” the very nature of large urban centers makes them vulnerable. “If you want to live in a free, liberal democratic society you’re going to be vulnerable to these types of things, because you can’t barricade every bike lane or park or open space or university,” he added. “The pace of attacks around the world has been picking up,” he said. In August, a van plowed into a crowd in Barcelona’s La Rambla tourist hot spot, killing 13 and wounding more than 100. It was the sixth deadly attack in Europe involving a car or truck in a little more than a year: Two occurred in London, and the others were in Nice, Berlin and Stockholm. The suspect in Tuesday's attack was identified as a 29-year-old Uzbek immigrant named Sayfullo Habibullaevic Saipov who entered the U.S. in 2010, law enforcement officials told NBC News. The gunman hopped out of the truck and shouted "Allahu Akbar" before firing a BB or pellet gun, four senior law enforcement sources said. The suspect was then shot in the abdomen by a police officer. Law enforcement sources said he left a note in the truck claiming he committed the attack for ISIS. New York Gov. Andrew Cuomo added that this appeared to be the work of a "lone wolf." "There's no evidence to suggest a wider plot," he said. Clarke said the rise of using vehicles in terrorist attacks marked a significant shift in tactics from the major attacks orchestrated by al Qaeda and related groups in years past. But now extremist groups such as ISIS have called for attacks using simpler means that are easier to carry out. “A motorized vehicle is an obvious killer weapon and New York City was the perfect target. I’m afraid there will be more like this," said Michael Nacht, a national security expert and professor of public policy at the University of California Berkeley. Other types of attacks require more planning or resources and are easier to detect, said Rick Mathews, a homeland security expert at the State University of New York at Albany. “The things we see now are that when terrorists attack by getting a vehicle or renting a truck, which is not illegal, there is a great deal of difficulty detecting. It makes it harder to stop them," he said. Clarke said the increase in such attacks has prompted law enforcement, as well as other officials and even urban planners, around the world to discuss how to best protect cities. "A broad-based, comprehensive approach is necessary, but again there's only so much you can do to prevent these type of soft-target attacks," he said. While authorities might increase vigilance on vehicle rentals in the near future, it was difficult to assess any long-term policy changes that could arise from Tuesday's attack, said Erroll G. Southers, a professor of the Practice of Governance at the University of Southern California. Clarke added that politicians and police are in a difficult position, trying to enact change but also not wanting to reinforce a sense of fear in communities. "In my own opinion, terrorists have scored a small victory because this is ubiquitous, the thinking of planning for these attacks, it was really unheard of a year or two ago," he said. Bratton said one of the issues with these attacks was the fear they create for communities. "The whole idea of fear is, all that we try to do in law enforcement and in private security is to replace the fear with awareness," he said. "We can live aware and we have to be aware, but the worst thing that could happen would be to be so overcome by fear that we cease to function in normal ways," he said. "We need to go on with our lives."